A Birds-Eye View of Bluffton from near the turn of the century. 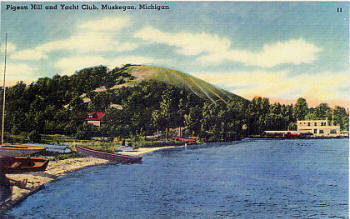 This community, located between Lake Michigan and Muskegon Lake in the city of Muskegon, was the summer playground for a large group of vaudevillian performers. The most famous was legendary silent film star, Buster Keaton. Beginning around 1903, vaudevillian performers began to summer in the area. 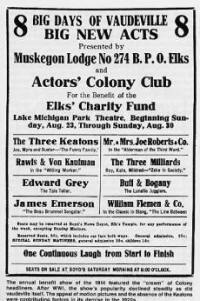 Like many others, the Keatons discovered Muskegon during appearances at the theater in 1902 and 1905. They became enthralled with the area, and beginning in 1907, the family returned annually. In the shadow of a massive dune known as Pigeon Hill. 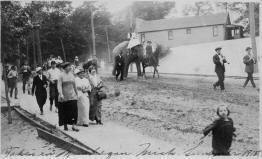 The Colony celebrate Joe Keaton's birthday with a parade through Bluffton. The guest of honor and his bride Myra Keaton ride Minnie the elephant - a performer in Max Gruber's "Oddities of the Jungle" act. Muskegon's Lake Michigan Park Theater. For Joe, the patriarch, it was a slice of heaven. Bluffton offered a break from the constant touring associated with vaudeville. He liked the recreation offered by the lakes, the presence of other performers, and the carefree atmosphere of the area. For his wife, Myra, a passionate card player, the community offered an endless supply of pinochle partners. For his children, it was a place to call home. From left to right: Joe Keaton, Paul Lucier and William "Mush" Rawls. The three vaudeville performers were instrumental in the formation of the "Artist's Colony Club" in 1908. 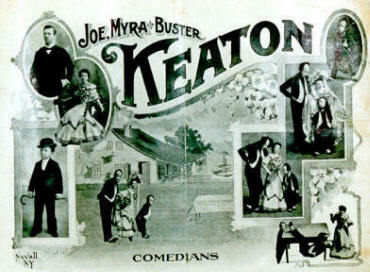 On June 14, 1908, Joe Keaton and friends launched the "Artist's Colony Club" (later known as the Actors' Colony). Keaton served as president, while Paul Lucier, a comic bellhop on the vaudeville stage, held the rank of vice president. William "Mush" Rawls, a jack-of-all-trades in vaudeville, handled the duties of treasurer and secretary. Late in the summer, the group built a rustic, one-story clubhouse to serve as their headquarters. 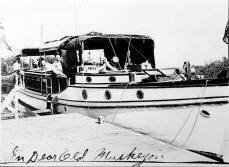 The building was located on waterfront property owned by Lew Earl, the first thespian to make Muskegon his permanent summer home. (Because of this fact, Earl carried the honorary title of "Mayor of Bluffton".) Known for its exposed framework and unpainted state, the building was fittingly christened "Cobwebs and Rafters." The Colony's first clubhouse, lovingly christened "Cobwebs and Rafters." By 1911, over 200 performers resided in the Colony and activities included an annual vaudeville show. In 1916 a new clubhouse, the Theatrical Colony Yacht Club, was built to help handle the growing number of members and boats. In 1917, an annual regatta was added. State of Michigan Historical Marker honoring Keaton and the Actors' Colony. The Colony's new clubhouse. known as the Theatrical Colony Yacht Club, or T.C.Y.C for short. However, by the early 1920’s, the rising importance of the film industry helped bring an end to the glory days of the Actors’ Colony. The Keatons moved to California, joining their son in Hollywood. Joe Roberts, another member of the colony, was recruited by Buster to portray the “heavy” in Keaton’s early films. Big Joe Roberts joined Buster Keaton in Hollywood, appearing in numerous classic silent films. Many others left the area to find work. By 1938, the activities of the colony had faded from the Bluffton landscape. But the memories live on. Ad for the 1914 Actors' Colony show - an annual warm-up for another season on the road. 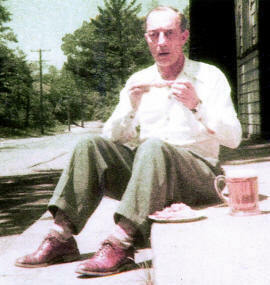 Buster returned to Bluffton for one last visit in 1949. Here, he enjoys some perch and a beer on the steps of Pascoe’s. 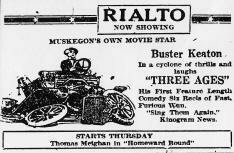 "Muskegon's Own Movie Star" - a 1923 local advertisement for Buster Keaton's first feature length film - Three Ages.